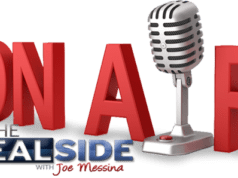 Our local State Assembly race is a hotly contested partisan race this year with Democrat Christy Smith challenging incumbent Republican Dante Acosta to represent us in Sacramento. I flipped it over. YES! 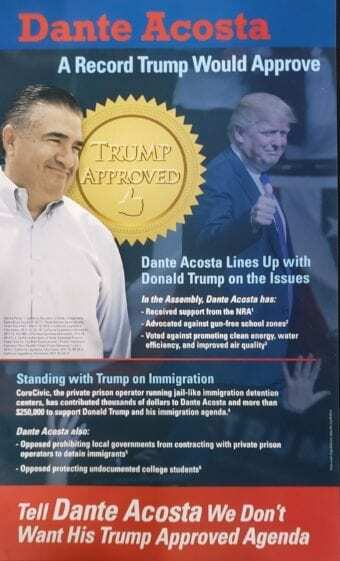 Dante Acosta! Cool ad Dante! YES! 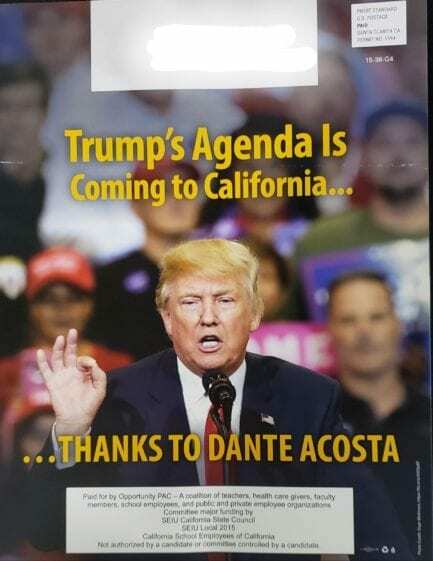 Dante is pushing Donald Trump’s agenda in the Assembly! WAIT! Not so fast there… why does it say STOP Trump and Dante at the bottom? Holy cow… this is an OPPOSITION piece AGAINST Dante. 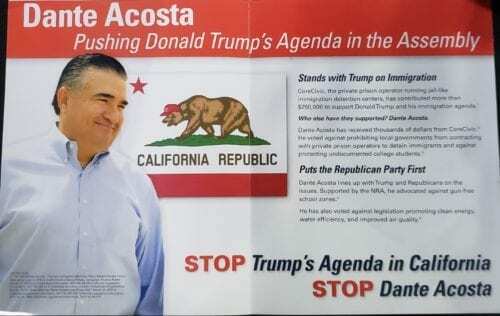 This is how out of touch California Democrats are. 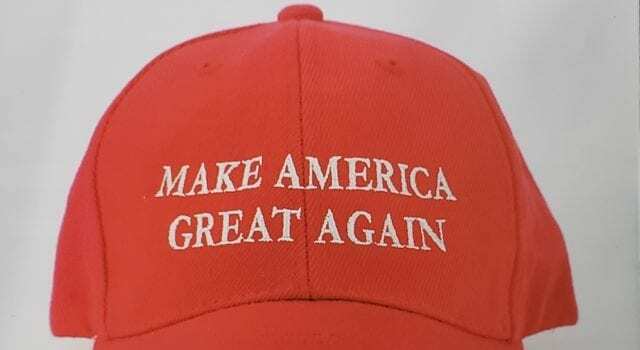 They are so sheltered in their California Liberal Progressive Leftist bubble that they are not even registering how many Americans LOVE this President. Maybe they don’t see how many people turn out to attend Trump’s rallies. Or maybe they’ve bought the lie that those are paid attendees. But they’re not. 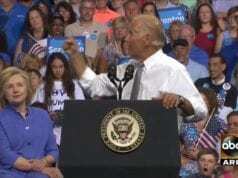 We who support President Trump KNOW that rally attendees aren’t paid. And neither are the thousands who stood in line to get into the rally but didn’t make it before the venue hit capacity, so they stand outside during the rally to support him anyway after standing in line for hours. That’s how much people love this President. This ad and the others that followed it in the same format are the exact opposite of an anti-Dante ad. 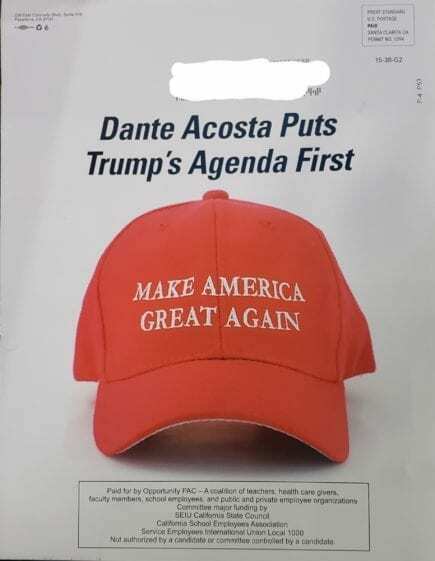 These ads actually make the case to vote FOR Dante. Independent thinkers who are paying attention to the changes in our country under Trump’s leadership can see the gigantic strides Trump’s agenda has made to support, bring relief, and improve the lives of middle class Americans. We feel the relief in our wallets. Business owners feel the relief in rolled back regulations. And we’re willing to vote for anyone who stands with him to bring on more of the same. 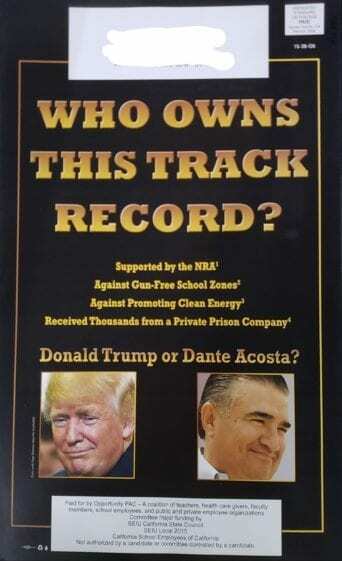 Dante Acosta, a record Trump would approve. 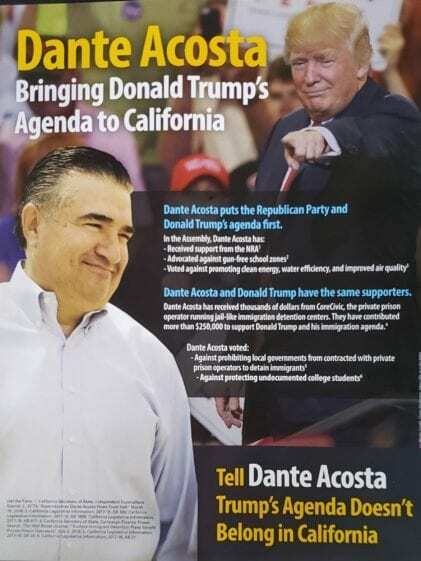 Dante Acosta Lines up with Trump on the issues. Standing with Trump on immigration. 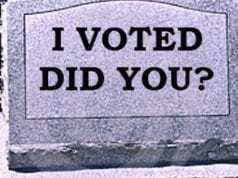 Paid for by Opportunity PAC. Who owns this track record? Donald Trump or Dante Acosta? Paid for by Opportunity PAC. And the list goes on… Who wouldn’t want that?!? BRING IT ON! 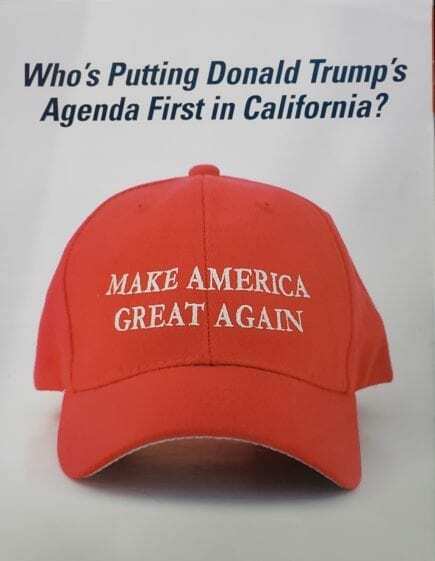 That’s just what California needs! 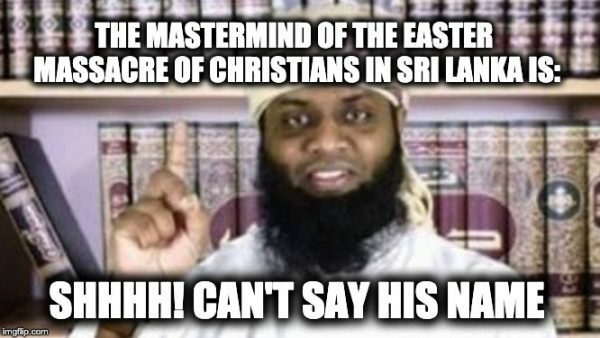 Next articleDems prove you CAN buy an election!